I am not what you would call a fan of orange. To think about it, except an orange t-shirt i bought from Escada a while ago ( and mainly because it got a huge discount), i don't have orange clothes at all. 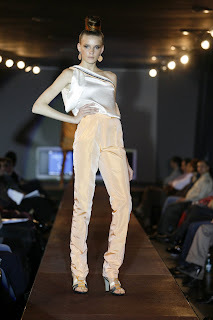 But that is just because till a few days ago, when i attended a fashion show by Claudia Castrase (to present its collection for spring-summer 2008, entitled Karyatides), i didn't know how to wear this color properly. Notice how the navy is accentuated by the subtle orange accents? And how white can be so feminine and cute combined with orange lines here and there? New Web Store Offers Authentic Celebrity Wholesale Designer Handbags at Low Discount Prices: Fendi, Gucci, Prada, Coach, Dior, Chloe, Balenciaga, Louis Vuitton and More! http://www.shopstarstyle.com Shop Star Style has become the favorite stop for many celebrities and the who's who in Hollywood. One trip to ShopStarStyle.com and you will be hooked. Looking for the hottest handbag at a discount price? It's here. Looking for gifts for birthdays, weddings or someone you love? It's here. Got to have that necklace you saw in In Style Magazine? It's here. Where did Lindsay get that dress? Yes, at Shop Star Style. From bling to bluejeans, celebs like Jessica Simpson, Nicole Ritchie, Paris Hilton and Mischa Barton get their goodies here. Use code FIFTYOFF for 50% until January 20th, 2008! Outfit for today: Birthday party!